The rematch between three-time Super-Middleweight world champion Carl Froch and top contender George Groves was certainly one of the most anticipated fights of 2014 thus far. An electric crowd of 80,000 spectators packed into the legendary Wembley Stadium in London, England on May 31st to see the two men do battle for the second time. Although it did not take long for a fight to breakout in the first encounter between Froch and Groves, the rematch would begin at a more tactical and measured pace. In contrast, to the first fight where Groves was able to drop the champion in the opening round. Groves’ timing and hand speed seemed to give him a slight edge in the early rounds. The early rounds were close and there could be a difference of opinion as to who had an edge. Groves seemed to be able to get his punches off a little more than the champion, even though both fighters had their moments. In a tactical Boxing match, sometimes it simply boils down to who is able to do a little more that will determine who wins a round. Groves’ ability to establish his jab as a focal point of his offense, use his lateral movement, and mix in occasional combinations is what won him the early rounds in my opinion. Although he was able to have his share of moments early on, Froch appeared a bit hesitant to let his hands go, perhaps out of respect for Groves’ hand speed and timing. Much like the first fight, Froch began to open up more in the fifth round as he briefly stunned Groves and began to focus more on Groves’ body as a target for his offense. This turned the momentum in the champion’s favor by setting up his offense to the body and then the head of Groves. Froch was able to follow up by applying pressure and periodically getting the challenger on the ropes and continuing to land to the body in round six. Groves however, was able to briefly stagger Froch with a left hook in round seven. Froch, who is known for having a solid chin was able to take the punch as he continued to press forward. Froch’s steady pressure and body/head attack from rounds five through seven put him in control of the fight in my eyes as it entered the eighth round. The champion would bring the fight to a sudden and dramatic conclusion in the final minute of round eight when a flush overhand right landed on the chin of the challenger knocking him down to the canvas. Referee Charlie Fitch immediately stopped the fight. Unlike the first encounter however, where Referee Howard Foster stopped the fight prematurely in the eyes of many by stepping in while Groves appeared staggered, but did not go down, the rematch had a more conclusive ending. Although like the first fight, the rematch was stopped immediately, it was not a controversial stoppage. The right hand that dropped Groves sent him down in a position where his left knee was bent at an awkward angle that could have led to a serious injury. With much of the discussion preceding the rematch concerning the referee and with this observer calling it arguably the most important assignment of his career prior to the fight, Referee Charlie Fitch did a fine job and made the appropriate call in stopping the fight. A victory for Froch that is both a vindication for the controversial circumstances, which resulted in his being victorious in the first fight and a validation that he is still one of the two best Super-Middleweights in the world behind only Andre Ward who defeated him in December 2011. As I said following the first fight between Froch and Groves, in the years since losing to Ward, Froch has made a very good argument as being the number two or 1-A fighter in the division. Both Ward and Froch hold a claim to the WBA world title in the division with Ward being designated as a “Super” champion by the WBA due to previously holding status as a unified champion, and by Froch also holding the IBF world title and defeating former three-time Super-Middleweight champion Mikkel Kessler in their rematch in May of last year, who held interim/regular status by the WBA to be recognized as a unified world champion. 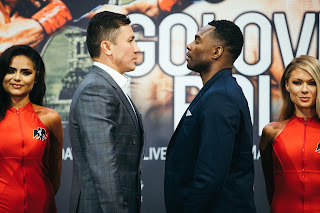 If nothing else to settle confusion as to who holds the WBA Super-Middleweight world championship, it appears logical that a rematch between the two should happen. It is however, debatable as to whether a rematch between Ward and Froch will take place in the near future as Ward has been sidelined due to a legal dispute between himself and his promoter Dan Goossen. There are however, other lucrative options on the table for Froch. One name that has popped up more than once as a possible opponent for Froch is former WBC Middleweight world champion Julio Cesar Chavez Jr. who would certainly draw significant attention if a fight between the two were made. Chavez, in addition to being a former world champion certainly brings a sizable fan following and name recognition value to any potential opponent. From a business standpoint, a fight between Froch and Chavez could be a sizable pay-per-view draw here in the United States as well as in Mexico, and the United Kingdom. If a fight with Chavez is not made, other options include current WBC Super-Middleweight champion Sakio Bika and current WBO champion Arthur Abraham, who Froch defeated in November 2010. There is also the possibility of current unified WBA/IBO Middleweight world champion Gennady Golovkin potentially moving up in weight to the Super-Middleweight division to challenge Froch or, top Super-Middleweight contender James DeGale, who defeated Brandon Gonzalez on the undercard of the Froch-Groves rematch to earn a number one ranking in the IBF’s Super-Middleweight ratings. Even though DeGale is now a mandatory challenger for Froch, Froch is allowed to make a voluntary defense before facing him. Although potential fights with all the above each have appeal, I believe from a business standpoint that a fight between the thirty-six year old Froch against either Chavez or Golovkin has the most lucrative potential if a rematch with Andre Ward is not in the cards. All Boxing fans would welcome any scenario concerning these three fighters. As for George Groves, I believe he will only benefit from his two setbacks against Froch. Groves did after all give the champion all they could handle in two fights. Groves has nothing to be ashamed of and should be looked at as a key player in the division going forward. Along with vindication and validation, Carl Froch can also make a legitimate claim as being the marquee attraction in the division going forward. With much anticipation leading up to the rematch, drawing 80,000 people to the legendary Wembley Stadium, and bringing closure to a disputed controversy, it is hard to argue against such a claim. The rematch between Carl Froch and George Groves will indeed go down as a memorable night in Boxing history for the right reasons. Carl Froch has always given everything he has when he enters the ring and has been willing to take on all comers. He certainly deserves the most lucrative fights available to him at this stage of his career.